Illustrator Hal D. Crawford drew this image for the 1970 book "The Aliens" by Crawford, Hayden Hewes and Kietha Hewes. It depicts a creature associated with 1950s UFO landings. Momo eyewitnesses in Louisiana, Mo., claimed the illustration looked almost exactly like the creature they saw during the summer of 1972. Used with permission. Does a real-life monster roam the Missouri wilderness? Its name is Momo  the Missouri Monster. 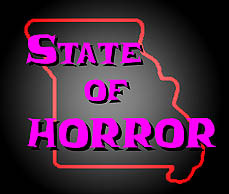 Momo sightings have been reported throughout Missouri, even in St. Charles County. But the most famous sightings occurred in Louisiana, Mo., a town of fewer than 4,000 people. Located in Pike County, Louisiana lies 75 miles northwest of St. Charles County. Bigfoot-like creatures have been reported in the Louisiana area since the 1940s, but it was not until the early 1970s that Momo attracted serious interest. 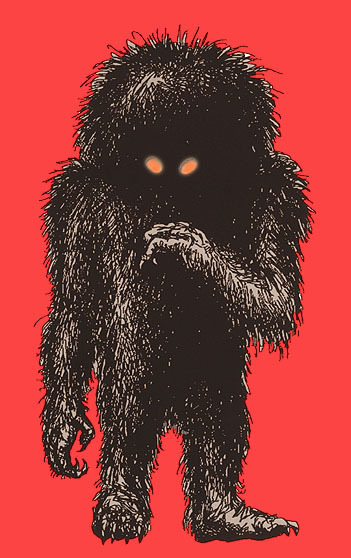 Bigfoot researcher Loren Coleman describes the now-legendary Momo scare in his book, "Bigfoot! The True Story of Apes in America." According to Coleman, the Momo saga began in July, 1971. Joan Mills and Mary Ryan were driving along Highway 79, north of Louisiana, when they allegedly saw a hairy creature that made disturbing gurgling noises. The women described the thing as "half ape and half man." The youths reported a chilling detail  the creature, streaked with blood, carried a dead dog under its arm. A local farmer reported his dog had disappeared. A neighbor reported hearing terrible growling sounds that afternoon. Edgar Harrison, the children's father, also heard loud growls the evening of July 14. He and several other people smelled a strong, unpleasant odor as they investigated the area around Marzolf Hill. Investigators later reported smelling a similar stench, like rotting flesh. On July 21 Momo revealed itself to Ellis Minor outside his home on River Road. It was around 10 p.m. when Minor heard his dogs barking. He grabbed a flashlight and stepped outside, expecting to see an intruding dog. Instead, he saw a 6-foot-tall monster standing in his yard. The black, hairy creature turned and ran. According to a July 23, 1972 story in the St. Louis Post-Dispatch, police sealed off a 200-acre wooded area while a team of 25 hunters searched for the creature, which many believed to be a black bear. Police received reports of a creature crossing the highway with a dog or sheep in its mouth. Another witness told police that the creature lifted the back of his automobile. Not all hunters used guns. Many used pencil and paper. Bigfoot investigators swarmed Louisiana, interviewing witnesses and taking plaster casts of the creature's unusual three-toed footprints. One of the preeminent researchers was Hayden Hewes, director of the Oklahoma City-based Sasquatch Investigations of Mid America. "What impressed me was the willingness of people to talk to us. Normally people are reluctant to talk about these things," said Hewes, 61. "This was not just one person spitting in a can, saying `yes sir, I saw it right over there.' These were good quality people who were enthusiastic about what was going on." Hewes said he was impressed with the witnesses' sincerity. "These people didn't want to sell something. They didn't want publicity. They just wanted to share their stories. I never got any inkling that there was a hoax." 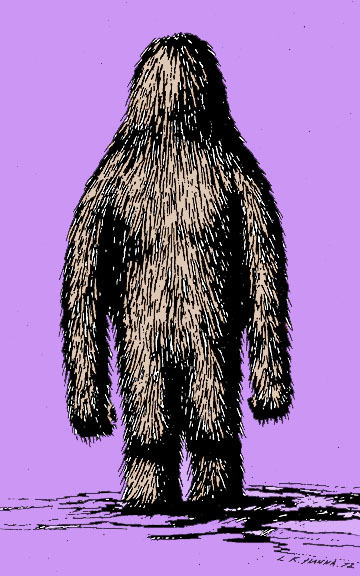 A sketch of the creature reported by Doris and Terry Harrison on July 11, 1972, in Louisiana, Mo. Courtesy of MUFON. The Momo scare lasted only two weeks, but it triggered a media frenzy. Television and newspaper journalists from across the nation descended on the small town. "I did close to 75 television and newspaper interviews," Hewes said. "They flew me to Chicago to do some television there. There were people around us shooting documentaries. We haven't had a case that well-documented since." Sasquatch Investigations of Mid America is an offshoot of the International UFO Bureau, an organization Hewes founded in 1957. "We researched Bigfoot sightings in eight states, mainly to see if there was any connection with UFO sightings," he said. "With Momo, we found there was no correlation whatsoever with UFOs." Hewes said his investigations suggest there are families of nocturnal Bigfoot creatures that continuously migrate across the nation from the Pacific Northwest to the southeast. "The path begins around Oregon and Washington state," he said. "It crosses Oklahoma around the first week of September, then finishes in Florida." When he is not conducting paranormal investigations, Hewes runs a talent agency and works in warehouse distribution in Oklahoma City. Hewes has a degree in aeronautical and space engineering from the University of Oklahoma. While Hewes and other researchers concentrated on Louisiana, one team of investigators focused on sightings in the St. Charles County vicinity. John Schuessler was living in O'Fallon during the Momo scare. Schuessler worked for McDonnell Douglas as a group engineer for life support systems on the Sky Lab space station, then later as director of flight operations for the Johnson Space Center in Houston. In 1969, Schuessler helped establish the Mutual UFO Network (MUFON), an international collective of UFO researchers. The 71-year-old Schuessler still directs the organization from its headquarters in Colorado. The Momo scare coincided with a rash of UFO sightings, including reports near his home in O'Fallon. The possible UFO connection intrigued Schuessler, so he joined the Momo investigation. Schuessler found no connection between Momo and UFO activity, but he did investigate two incidents that corroborated the presence of Bigfoot creatures in the region. On June 30, 1972, a month before the Harrison sighting in Louisiana, two young men from Troy were fishing on a secluded bank of the Cuivre River near Cuivre River State Park in Lincoln County. The fishermen, named Vaughn and Tim, stood atop a high bank overlooking an unusually low bank on the river's opposite side. According to Schuessler, Vaughn noticed a splash and looked up. "They said they saw something wading across the river  a big, hairy thing. They didn't know what it was," Schuessler said. "Vaughn said, `Hey Tim, look at that silly hippie wading across the river.' Then they realized it was not a hippie." The men described the creature as standing taller than a normal man and hairy all over, Schuessler said. Like the Louisiana creature, the Troy monster's hair completely covered its face. Its head looked like a dome resting on its shoulders. Tim scrambled up a hillside while Vaughn held his ground. The creature continued its deliberate march toward him. Vaughn finally panicked and ran. The men found a conservation officer and returned to the scene. "All they found were fresh, three-toed footprints where the creature came out of the water," Schuessler said. Schuessler inspected the area the next day and found the prints. "They were large prints, but I couldn't tell what made them," he said. "We looked for hair, but found nothing but tracks." Schuessler said Vaughn and Tim seemed honest and genuinely frightened. Schuessler also interviewed the conservation officer. "He said he'd gotten a lot of weird reports out of the park, but he didn't pay attention to them. I think he wanted to stay at arm's length from it all," he said. An illustration depicting the Troy creature wading across the Cuivre River. Courtesy of MUFON. Another Momo sighting took place July 24 near O'Fallon, just after the final Louisiana sighting. Two teenage girls reported seeing a hairy creature at sunset walking along the edge of a wooded area. The O'Fallon incident is mentioned in "The Bigfoot Casebook" by Janet and Colin Bord, but Schuessler does not remember the details. "It was not as vivid as the Troy sighting," he said. Momo must have enjoyed his sojourn in St. Charles County, because the creature apparently passed through town again four years later. The "Bigfoot Field Researchers Organization" Web site lists Momo sightings in 29 Missouri counties, including a 1976 report from St. Charles County. According to the report, two people were in a boat on the Missouri River near Highway 40-61 when they saw what appeared to be a 6-to-7-foot tall creature covered in dark brown hair. The creature was drinking from the river when it saw the boat, stood up and ran into the trees. 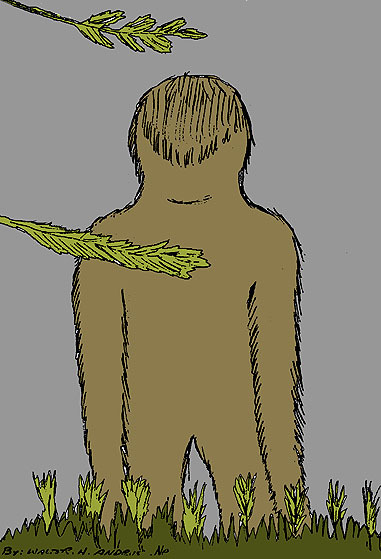 Another local story is posted on the "Bigfoot Encounters" Web site. Mark Richardson, of Modesto, Calif., claims to have seen the creature in 1979 when he was living in St. Peters. According to Richardson, he and a friend were on a railroad bridge over Dardenne Creek one night. Richardson saw shadows moving and assumed it was his friend. To his shock, he discovered it was an 8-to-9-foot-tall creature with long, matted brown hair covering its body and face. Its shoulders were five feet wide. Its three-fingered hands hung below its knees. The creature smelled like rotting hair and screamed like a panther. Richardson claims it lifted the railroad timbers and tried to grab his friend. The two escaped and ran home. Richardson claims he knows other people who saw the St. Peters creature. He could not be reached for comment. So is Momo real? Investigators like Schuessler say the sincere testimony of eyewitnesses cannot be dismissed. "There is definitely something going on," Schuessler said. "I just don't know what it is." This story was originally published in the Suburban Journals of St. Charles County, Oct. 31, 2004. Used with permission.